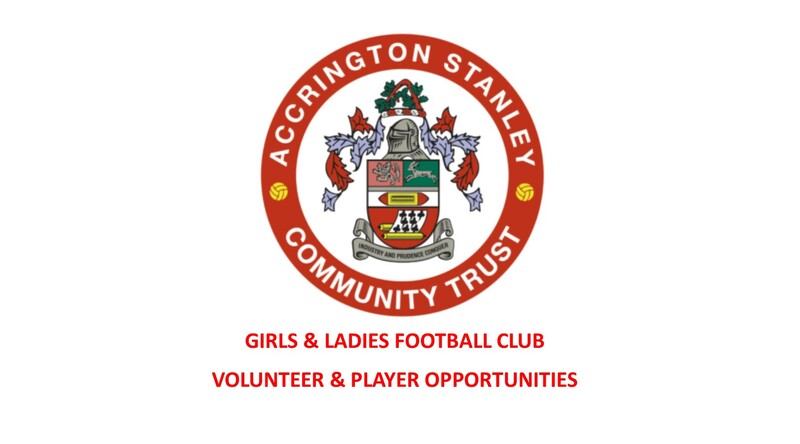 Accrington Stanley Community Trust are in the process of developing a junior section to their already established Ladies team. We are an award winning charity and are constantly looking at providing opportunities to all ages and abilities. If you know any budding female footballers aged 5 to 14 year olds who would love to represent Accrington Stanley, invite them to our girls development centre held at Hyndburn Leisure Centre, 6pm to 7pm on Monday evenings. The sessions will cover a variety of techniques and skills as well as small sided matches, to provide the girls with the best start on their footballing pathway. Once we have the teams we will arrange friendly matches for the girls so that they have experience of playing as a team as well as the opportunity to play in a competitive environment. We are looking at forming the teams this year with the intent of entering the teams for the 2019/2020 season. Further to this, we are looking at recruiting enthusiastic and reliable volunteers to help manage or assist one of the teams. Are you someone who is passionate about football? Do you want to be a positive role model? If yes, then get in contact with Elle Kayley on 01254 304071 or email elle.kayley@stanleytrust.co.uk.